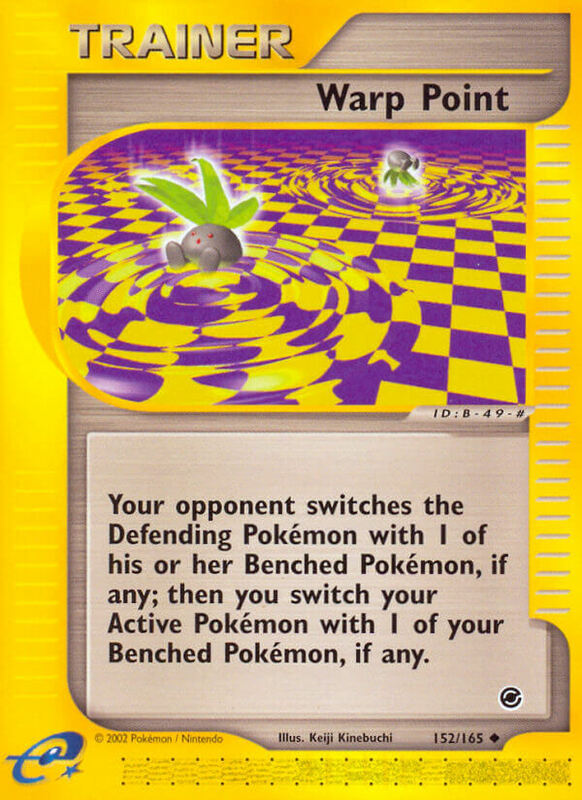 Your opponent switches the Defending Pokémon with 1 of his or her Benched Pokémon, if any; then you switch your Active Pokémon with 1 of your Benched Pokémon, if any. No, this is better because it puts pressure on your opponent. I also remember a game in which I would have won if it weren’t for Warp Point. The game was tied 1-1 on prizes. I had an active Gyarados SF with no damage on it playing against Chenlock (consisting of Sableye SF to use disruption supporters to lock you out of resources, Garchomp C Lv. X to snipe whatever support you may have, Blaziken FB Lv. X to have a cheap attacker, and Power Spray to stop your Uxie LA’s Set Ups. My opponent had an active Sableye, and my bench was full of Sableye, Combee SF, Uxies, and Azelf LA‘s. He had Blaziken FB Lv. X on the bench with Fire Energy and Energy Gain attached. Moral of the story: Warp Point wins games. This card went in practically every deck not named “Vilegar” during the 2009 season. I have so many of the league promo DP/Pt reprint. Honestly, I while I do have a lot of the league promos, I actually have more copies from this set.